The Wizpig Amulet is a type of item that's found in the game, Diddy Kong Racing and the remake. There are a total of four pieces of the amulet, with each piece being guarded by Tricky, Bluey, Bubbler, and Smokey, who were entrusted by Wizpig with the pieces of the amulet after he brainwashed them. One can be obtained by beating a boss in a race twice during the regular races and the Silver Coin races. When the player collects all the pieces of the Wizpig Amulet, the Wizpig Head at the island courtyard will open its mouth, and the player will gain access to the first race against Wizpig. There is a similar item called the T.T. Amulet, which is also divided into four parts that the player must obtain. Icon shown on the pause menu for Diddy Kong Racing DS. 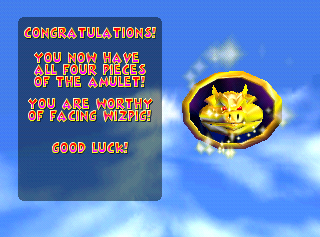 The completed Wizpig Amulet in Diddy Kong Racing DS. This page was last edited on January 19, 2019, at 21:00.